integrating use into a healthy, enjoyable, and productive life. Mitragyna speciosa is a leafy tree that grows from 3-20 meters tall. Its leaves contain 7-Hydroxymitragynine and mitragynine. 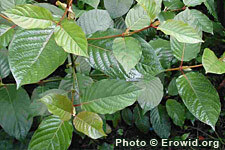 The leaves are chewed as an opiate substitute and stimulant in Thailand and South-East Asia, primarily among the working class. It has a relatively long history of human use. Apr 3, 2018: FDA orders mandatory recall of kratom products contaminated with salmonella. FDA.gov Press Release. Mar 23, 2018: The US CDC attributes an outbreak of salmonella to kratom ingestion. Illnesses started on dates ranging from Oct 13, 2017 to early 2018. Feb 18, 2018: The US FDA released additional information about deaths related to kratom.